Headlining the two-day event is one of the world’s leading Burns performers, Christopher Tait, who will be re-enacting the Tam o’ Shanter and recalling the life and works of our most famous son. Tait has been portraying Robert Burns for over 15 years and has made many television appearances throughout the world. His film Robert Burns Live received rave reviews throughout the USA, Europe and Asia and has won critical acclaim with Burns scholars worldwide. Guitarist and vocalist, Jack Badcock, will also be performing the songs of Burns. Originally from Dublin, Jack is now based in Edinburgh where he became known for his fine voice and captivating interpretations of old and new songs. This will be Badcock’s last appearance ahead of Celtic Connections this year, where he will perform as one of the six finalists in the BBC Young Traditional Musician of the Year Award 2014. The weekend celebrations will be compered by Stuart Cassells, founder of the world renowned Red Hot Chilli Pipers. Stuart will be thrilling guests with his own rendition of Address to a Haggis before traditional fare is served in the recently refurbished Glenturret café. Visitors will also have the opportunity to sample some of the finest whiskies throughout the weekend with a free drop-in tasting and blending session run by Brand Ambassador Lucy Whitehall. “As the spiritual home of Scotland’s favourite whisky we are keen to raise a toast to Burns and celebrate our national poet. A range of exclusive offers will also be available from the gift shop. This includes a limited edition bottle of The Famous Grouse 37 year-old blended malt whisky, created to signify every year of Burns’ extraordinary life. 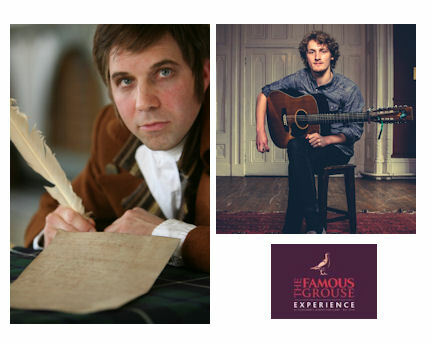 For more information please visit www.thefamousgrouse.com or to book a tour please call 01764 657 005 or email events@thefamousgrouse.com.